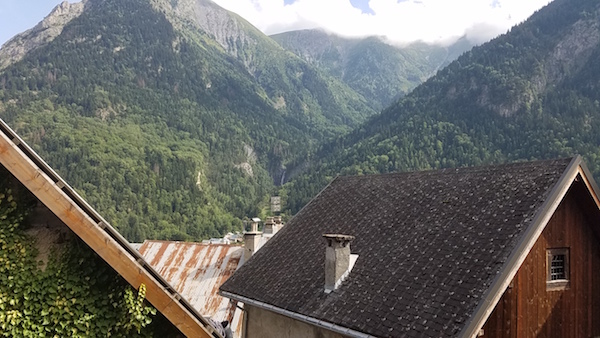 Today we drove from Provence to the quaint artist village of Venosc, in the Ecrin National Park, a narrow glacier-carved canyon in the Alps. This may be one of the prettiest villages in France, and our view is spectacular. Here I am on our balcony, and my view from our balcony to the waterfall in the canyon opposite Venosc. This afternoon we drove to the hamlet of La Berarde, at the end of the valley. It's one of the prettiest mountain settings I've ever seen. Tomorrow we'll tackle the infamous 21 switchbacks of Alpe d'Huez, followed by the Col de Sarenne which takes us up beyond the Alpe to nearly 7,000 feet in elevation. Should be a great day!